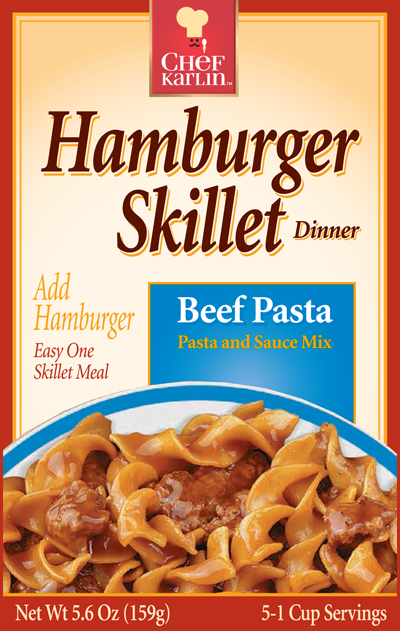 Ingredients: Enriched Pasta (Wheat Flour, Niacin, Iron, Thiamine Mononitrate, Riboflavin, Folic Acid), Salt, Corn Starch, Sugar, Dextrose, Bleached Wheat Flour and Malted Barley Flour, Modified Corn Starch, Hydrolyzed Soy Protein, Caramel (color), Monosodium Glutamate, Onion*, Garlic*, Spice, Natural Flavor, Corn Oil, Disodium Inosinate, Disodium Guanylate, Citric Acid, Yellow 5 and Yellow 6. Stir in 1 cup milk*, 2 ¼ cups hot water*, sauce mix and uncooked pasta. * For a more broth-like sauce, increase hot water to 3 ¼ cups and omit milk. Mix in uncooked pasta, sauce mix, 1cup milk* and 2 ½ cups hot water*. Microwave uncovered on HIGH for 8 to 12 minutes, stirring every 4 minutes until pasta is tender. (Sauce will thicken as it stands). * For a more broth-like sauce, increase hot water to 3 ½ cups and omit milk.